The Big Green Egg is by far the most popular kamado-style cooker in North America. Having been around since 1974, it seems safe to assume the Big Green Egg isn’t going anywhere. We love our Eggs — this cooker has stood the test of time and developed an immense fan base. The broad network of Big Green Egg owners & retailers is another advantage of the product: accessories and other parts are always easy to find, and the online community of Eggheads is always willing to help. Nevertheless, there are the other manufacturers of ceramic cookers, and we’s willing to bet any of these will prove better than a run-of-the-mill metal grill or smoker, simply becuase they are based on the same basic design. Note that the Big Green Egghead has not personally tested all of the following products; the following is just a collection of observations on the other cookers on the market. The design and construction of Primo’s cookers will be very familiar to Eggheads. Primo offers two oval-shaped cookers which are supposed to improve capacity over the traditional round shape. The grid/rack system in Primo grills is adjustable, which some people prefer. Many think this adjustability is unnecessary, however, as the kamado design allows such precise control of how hot the coals burn. Couple this with the fact that ceramic cookers are often used for smoking, indirect cooking, and baking, and it seems that the advantage of adjustable grates is negligible. It is the opinion of this author that this adjustability adds unnecessary complexity to the simple elegance of the timeless kamado design. If variable cooking rack appeals to you, note that a simple grid-extender on the Egg provides similar functionality. The quality construction and large capacity of Primo’s product make it a worthy competitor to the Egg. 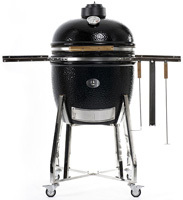 China-based Imperial Kamado has been manufacturing kamados for over 30 years. While they continue to produce and export kamados, retail activities have been transferred to Kamado King (see below) in California. 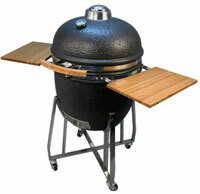 The Big Green Egghead has not tested an Imperial Kamado, but they seem to have a very similar design to the Egg. 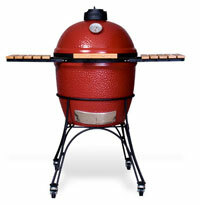 Kamado King distributes and sells Imperial Kamado brand cookers (see above) in the United States. 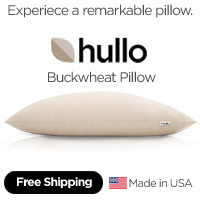 This company’s shtick is that they have based their product’s design on the traditional Indian tandoor oven. As far as we can tell, the design is very similar to the Big Green Egg, and little, if any, traits of a tandoor oven differentiate it from the competition. These visually stunning tile-covered kamados look similar the Kamado brand and are quite expensive when compared to most other brands. 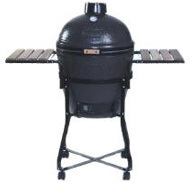 That said, they appear to be well constructed, and have a better reputation than Kamado brand. I have heard the Komodo Kamado referred to as the "Rolls Royce of ceramic cookers". These cookers look similar to the Komodo Kamado brand and are sold under the brand name “Kamado”, a japanese word meaning “stove”. The exterior of these units is covered with colorful tiles which make for a handsome addition to your deck or patio. The price of these kamados is also relatively higher than other products. It is claimed that the word “kamado” was invented by the founder of this company, but this seems not to be the case. Egghead the Naked Whiz has an excellent article on this subject. One forum poster goes as far as to say that these products are made from portland cement, and not truly fired ceramics as the Kamado company claims, it is unclear if this is actually the case. Dragon Fire's product is distinguished by its stainless steel hardware and bamboo shelves and handle. In addition to the typical spring-assist lid, the Dragon Fire Kamado also includes a small stainless spring-loaded "Lid Shock" which cushions and absorbs some shock of closing the lid. I've never found a need for shock absorption when closing the lid of Kamados, so it seems a bit gimmicky, but it doesn't seem like it would hurt. The Monolith Grill is reportedly establishing itself as a player in the German speaking markets of Germany, Austria, and Switzerland. The overall form is quite similar to the Dragon Fire (above), as are the bamboo shelves, and wooden handle. The most distinguishing feature of the Monolith Grill is the sliding rack for wood chips. This apparently allows you to add wood chips without disturbing the food or cooking components. The Monolith site has some nice detail photos, and the PDF manual and catalog are some of the best marketing materials I've seen for ceramic grills yet. Thanks to Mike from the Netherlands for bringing the Monolith to my attention. Having just been released in April 2009, the Kamado Joe is a relatively new player in the expanding Kamado market. This product, too, is very similar to the Big Green Egg, with perhaps the most obvious difference being the color: the Kamado Joe is bright Red. This cooker also includes bamboo shelves and handle, wheeled "cart, and a cast iron top-vent. In 2010, the people who brought you the Bubba Keg Grill revealed a new incarnaiton of their product, coined the Big Steel Keg. It's hard not to think this is a direct play on the "Big Green Egg" name. Compared to ceramic, the steel grills loose points on aesthetics in my book, but I have yet to cook with one. It remains to be seen if this design variation catches on and is a true competitor in the market for ceramic-insulated-convection-kamado-grills. Did we miss anything? Are our comments off the mark? Drop us a line and let us know more about these products.